Should combat roles be fully opened to women? The number of women serving in the military has reached historic highs in the past decade, with women now representing more than 14 percent of the total force. 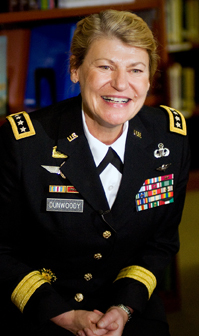 In 2008, Ann E. Dunwoody, the Army's top supply officer, became the first female four-star general. This fall the Army tapped Sgt. Maj. Teresa L. King to head its ultra-tough drill-sergeant training program, the first woman to hold the post. At the same time, controversy swirls around the under-the-table recruitment of Army and Marine women into some ground-combat missions in Iraq and Afghanistan — which is contrary to official military policy — as well as the Navy's plans to add women to submarine crews. Advocates of continuing to bar women from those jobs argue that sexual tensions and mistrust harmful to the military mission inevitably accompany gender-integration of combat teams. Meanwhile, women vets are suffering high levels of post-traumatic stress disorder and homelessness.